Abstract: Mosquito-borne pathogens cause some of the more deadly worldwide diseases, such as malaria and dengue. Tropical countries, characterized by poor socioeconomic conditions, are more exposed to these diseases, but Europe is experiencing an increasing number of human cases of mosquito-borne diseases, both imported and indigenous. Some of these cases are due to recrudescence of pathogens already present in the territory, particularly the West Nile virus. However, other neglected mosquito-borne pathogens remain present in Europe, and could produce human cases sustained by local mosquitoes (such as the Tahyna and Sindbis viruses). Native mosquitoes are still able to transmit pathogens eliminated from Europe and reimported by the sick (such as malaria plasmodia), as well as new imported pathogens. An increasing number of large epidemics involving arboviruses, for which humans could be reservoir hosts (eg, Dengue virus, Chikungunya virus, and Zika virus), seasonally concordant with the activity period of European vectors, poses an expanding risk for potential introduction of these viruses. More autochthonous cases of exotic diseases were reported in Europe, including dengue and chikungunya, raising the potential for the establishment of those pathogens which can be transmitted vertically in vectors. These episodes were often responsible for the establishment of exotic mosquitoes, such as tiger mosquito, imported into Europe by trade and now present in adequate numbers to transmit these pathogens. This actually occurred for chikungunya in Italy in 2007, with more than 200 cases of this disease. Other mosquitoes, potentially vectors of pathogens, can use the same means of entry into Europe, posing new potential risks for health. Dealing with mosquito-borne pathogens, characterized by a complex cycle, will require the establishment of interdisciplinary measures and an internationally coordinated approach, since these diseases do not recognize borders. Mosquitoes are insects known for their annoying habit of biting animals to obtain blood as the protein source to mature their eggs. During their blood meal, mosquitoes can transmit a wide variety of pathogenic agents, ranging from viruses to parasites, to their animal hosts. Several mosquito-borne diseases (MBDs) have been recognized for centuries and are associated to specific environmental conditions; for example, malaria was linked to the swamps by Roman authors as early as the third century BC.1 However, the ability of mosquitoes to transmit diseases has only been demonstrated relatively recently. Evidence of the ability of the Wuchereria bancrofti worm (the agent of human lymphatic filariasis) to develop in mosquitoes was provided in 1877, while in 1898, the Anopheles mosquitoes were proved to transmit malaria plasmodia to humans, and in 1900, Aedes aegypti was confirmed to transmit yellow fever.1 The ability of these diseases to travel in humans was recorded in historical time by the inadvertent export of some of these diseases, including malaria,2 yellow fever, and dengue,3,4 from the Old World to the Americas by the slave trade. Europe was endemic for malaria, a disease known for centuries causing underdevelopment in endemic areas, and finally eradicated in 1975.5,6 Nevertheless, Europe experienced epidemics of hemorrhagic fever transmitted by mosquitoes in its port cities in the 18th and 20th centuries (see “Historically reported diseases” section). Although the MBDs are more prevalent in the tropics and in counties with diffused poor socioeconomic conditions,7 the health problems related to these diseases are now increasingly reported in Europe; for example, the chikungunya outbreak in Italy in 2007, or several episodes of locally acquired dengue and chikungunya in France and Croatia (see “Diseases at risk of introduction” section and Table 1). The increasing incidence of such episodes in last 10 years demonstrated that Europe is not immune from MBDs, and that the continent is increasingly exposed to the return of old pathogens and to the importation of new ones, due to the modern social scenarios associated with greater movement of people and products and with changes in environmental conditions, such as climatic and landscape modifications. 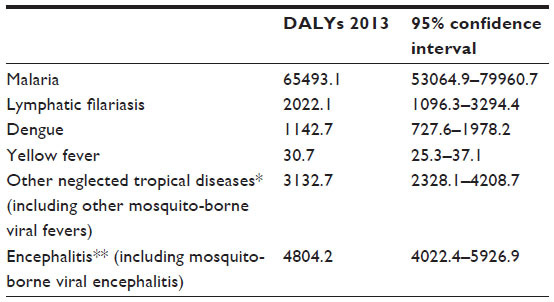 Abbreviations: DALYs, disability-adjusted life years; MBDs, mosquito-borne diseases. Arthropod-borne viruses, known as arboviruses, are a group composed of viruses from different families, without a taxonomic significance but with an epidemiological relevance (Table 4). Many arboviruses transmitted by mosquitoes are recognized as disease agents, and cause mainly systemic febrile disease, hemorrhagic fever, encephalitis, and polyarthralgia.6,29 Some of these can cause serious illness, while others just provoke just mild disease. Other viruses are not definitively linked to human disease, such as viruses isolated from a few sick persons or only serologically detected in humans (as Arumowot virus, Kedougou virus, Nyando virus, Shuni virus, and Tanga virus). 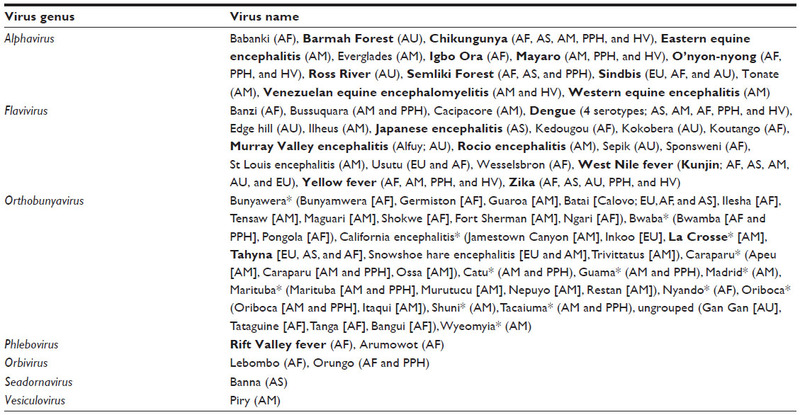 Abbreviations: AF, Africa; AM, America; AU, Australasia; AS, Asia; EU, Europe; PPH, primates as possible host; HV, human viremia suitable for vector transmission. Many mosquito-borne viruses belong to the Flavivirus genus, which includes some of the more pathogenic viruses; these may provoke hemorrhagic fevers or encephalitis. Yellow fever and dengue are two of the major world diseases caused by flaviviruses, with 200,000 cases estimated of yellow fever (30,000 deaths, 90% occurring in Africa),30 and 2.35 million cases of dengue in the Americas alone in 2013, of which 37,687 cases were severe.31 While dengue is spread in tropics and subtropics worldwide, yellow fever show a tropical distribution but does not occur in Asia.6 Both diseases are principally transmitted by the invasive mosquito Ae. aegypti; while Ae. albopictus has a secondary, but increasingly important, role in dengue transmission (see “Mosquito–pathogen interactions” section). WHO reported approximately 68,000 clinical cases of Japanese encephalitis every year (the first viral encephalitis in Asia);32 it is transmitted by several species of mosquitoes, principally rice-field mosquitoes.6 The globally widespread West Nile virus (WNV) causes symptoms in approximately 20% of infected persons, of which approximately 1% could develop encephalitis;33 however, the presence of that virus raises problems in the safety of transfusions and transplants. The MBD cycles comprise a dynamic interaction between pathogen, vertebrate host, vector, and environment,13 and could involve various vectors and hosts that have different weight in the transmission of the pathogen and can vary in distinct geographical areas. While the four main Plasmodium causes of malaria in humans circulate between mosquito and human,6,8 they harbor a sexual and asexual phase respectively; the virus cycles usually involve a wider range of species. Vector capacity is the overall ability of a vector species in a given location and specific time to transmit a pathogen.13 It is influenced by factors such as vector population abundance, longevity, feeding behavior, and gonotrophic cycle lengths and numbers.13 The most competent vector in laboratory conditions is not always the principal vector in field conditions. Experimental studies indicated that Culex modestus is a better WNV vector than Culex pipiens,43 but the latter mosquito seems to play the main vector role in different areas based on its abundance.44 An important consideration is that the absence of a proven vector of a pathogen in an area does not automatically mean that this area is free of risks since the autochthonous mosquitoes, not yet tested for this pathogen, could be potential vectors. This is particularly true for viruses that have different potential vectors, such as RVFV, which could be transmitted by several species of mosquitoes in different geographical areas in Africa, and is linked to the environments in which mosquitoes can proliferate.45 The entrance of Rift Valley fever is a risk for Europe, and it would be incorrect to exclude from risk, a priori, areas suitable for proliferations of mosquitoes with uncharacterized vector competences for RVFV. Nevertheless, the association between a vector and a virus is not a paradigm; adaptation of a pathogen to other mosquitoes is possible, particularly in the transmission of local pathogens by exotic species. The capacity of CHIKV to shift from Ae. aegypti to Ae. albopictus was already reported, and linked with a single amino acid mutation (from alanine to valine at position 226 of the envelope glycoprotein) recorded in strains which caused epidemics in Indian Ocean, Asia, and also in strain which caused the Italian outbreak. Other mutations of CHIKV, linked with enhanced capacity to be transmitted from Ae. albopictus, were also recorded in Asian lineage.46 A similar phenomenon could be hypothesized for Dengue virus (DENV).12 Dengue outbreaks were linked to the presence of Ae. aegypti, and epidemics sustained by Ae. albopictus are rare, but reported.12,47,48 The adaptation of DENV to the mosquito Ae. aegypti, was driven by the circulation of the virus in areas with high density of the reservoir host (humans) and this mosquito.4 However, DENV circulated between sylvatic Aedes mosquitoes (including the Asian tiger mosquito) in the original habitats in Asia, before its adaptation to Ae. aegypti.4 A possible “readaptation” of the virus to Ae. albopictus is not unlikely. Recent epidemic events sustained by Ae. albopictus, particularly the outbreak in Tokyo with at least 100 cases,49 indicate that this “readaptation” is ongoing. In recent years, a recrudescence of WNV was recorded in Europe. This virus was first serologically detected in Europe in two patients in Albania, in 1958.5 Subsequently, the virus was recorded discontinuously, with sporadic cases in several countries, until the 1996 outbreak in Romania with 683 suspected cases (Figure 1).6 An increasing number of cases was reported in the EU over the years, as reported by European Centre for Disease Prevention and Control (ECDC) between 2014 and 2011, with 672 autochthonous cases (128 in 2011, 242 in 2012, 228 in 2013, and 74 in 2014).53 This virus shows a complex cycle, which could involve distinct species of mosquito and wild birds in different areas. Different Culex mosquitoes can be the main vectors of WNV in distinct areas, depending on ecological conditions;6 in Europe, this role is often played by Culex pipiens.9,34 Due to this ecological plasticity, WNV can assume complex circulation patterns, as were recorded in several European areas, with alternating periods of circulation or cocirculation of different strains.54 Complex phenomena, such as herd immunity in wild birds, are likely to be involved in these patterns. Figure 1 Isolation or direct detection of European arboviruses at country level (map colors), and locations of autochthonous transmission of arbovirus exotic for Europe (circles). Abbreviations: CHIKV, Chikungunya virus; DENV, Dengue virus; WNV, West Nile virus; USUV, Usutu virus; SINV, Sindbis virus; TAHV, Tahyna virus; BATV, Batai virus; INKV, Inkoo virus; SSHV, Snowshoe Hare virus. After the eradication of malaria, several human cases with a probable autochthonous origin were reported over the years, demonstrating that a malarogenic potential is still present in Europe. Infected mosquitoes could be transported directly from endemic countries, especially by airplanes, causing airport malaria; approximately 90 cases of malaria due to this phenomenon were reported between 1969 and 2001 in Europe.5 The phenomenon of airport malaria confirms the possible importation of an MBD by infected mosquitoes and highlights the need for disinfection of aircraft coming from airports situated in endemic countries. The main route of introduction of exotic MBD is then not only represented by sick travelers, but also in other human activities such as animal trade (livestock, pets, zoo animals, and illegal trade) or direct transportation of infected mosquitoes by car, plane, or ship, could result in the import of mosquito-borne pathogens into Europe.5,34 Moreover, the importation of a disease by the trade of infected animal products is conceivable for some agents, as in the case of RVFV.76 Natural expansion of MBD is more improbable, but possible, as seen with infection in migratory birds.5 Characteristics of some of these pathogens raise the possibility of the use of some of these as agents of biological terrorism. Environmental surveillance, based on the fast laboratory screening of field-collected mosquitoes, is more suitable for detecting pathogens already present in the environment. Encouraging results were obtained in WNV surveillance in Northern Italy, which demonstrated that, with an adequate effort of sampling, circulation of the virus is recorded before human cases are documented.77 Moreover, with this kind of surveillance, other nontarget viruses can also be detected and important information collected about the species of mosquitoes present. The efficacy of disease surveillance will enable the early detection of cases and the prompt implementation of control measures. 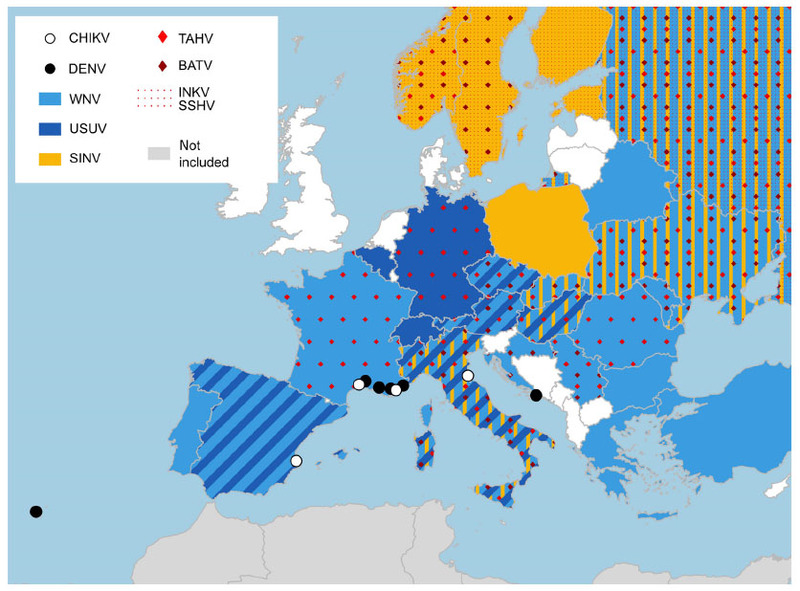 Europe could be affected by MBDs, both by the recrudescence of pathogens already present on the territory and for the importation of exotic agents, particularly by sick travelers. The increasing numbers of travelers and traded products amplify the risk that a pathogen can arrive in Europe; worldwide epidemics of MBDs in the period of mosquito activities augment the risk of introduction. High populations of exotic mosquitoes, able to transmit these viruses, are now established in Europe. The Italian epidemic of chikungunya, in which an Asian mosquito transmitted a virus of African origin in a European country, reflects the paradigm of globalization. A potentially pathogenic agent can appear unexpectedly in a territory, as occurred for the USUV in Europe, or for the Schmallenberg virus, a virus transmitted by culicoids and pathogen for ruminants that suddenly appeared and rapidly spread in Central Europe,80 and was probably introduced into the affected area from another country in an as yet unknown way. Correct prophylaxis and personal protection for travelers in endemic countries can reduce the potential for introduction of MBDs, but these measures are not always undertaken, and are available only for some pathogens, such as the vaccines for yellow fever and Japanese encephalitis, or prophylaxis for malaria. Socioeconomic factors, which are not easily manageable, are also involved in the diffusion of MBDs, due to illegal immigration or armed conflicts that start mass movements of refugees and deterioration of health services. The interconnection of multiple factors in the emergence of these pathogens is evident; for example, the decrease in the natural environment in developing countries, caused by the exploitation of natural resources, can prompt pathogens out from their sylvatic cycle. These pathogens can travel with people and reach territories thousands of kilometers far, where the conditions are suitable for causing an epidemic. Clearly, only a coordinated approach between countries – possibly on a global scale – and an interdisciplinary approach can effectively deal with MBDs, which do not recognize borders. Service MW. A short history of early medical entomology. J Med Entomol. 1978;14(6):603–626. Yalcindag E, Elguero E, Arnathau C, et al. Multiple independent introductions of Plasmodium falciparum in South America. PNAS. 2012; 109(2):511–516. Weaver SC, Reisen WK. Present and future arboviral threats. Antiviral Res. 2010;85(2):328–345. Vasilakis N, Cardosa J, Hanley KA, Holmes EC, Weaver SC. Fever from the forest: prospects for the continued emergence of sylvatic dengue virus and its impact on public health. Nat Rev Microbiol. 2011; 9(7):532–541. Gratz N. Vector- and Rodent-borne Diseases in Europe and North America: Distribution, Public Health Burden and Control. New York, NY: Cambridge University Press; 2006. Service MV, editor. The Encyclopedia of Arthropod-transmitted Infections of Man and Domesticated Animals. Wallingford, CT: CABI Publishing; 2001. World Health Organization. A Global Brief on Vector-borne Diseases [Document number: WHO/DCO/WHD/2014.1]. Geneva, Switzerland: WHO; 2014. Kettle DS, editor. Medical and Veterinary Entomology. 2nd ed. Wallingford, CT: CABI Publishing; 1995. European Centre for Disease Prevention and Control. Guidelines for the Surveillance of Native Mosquitoes in Europe. Stockholm, Sweden: ECDC; 2014. Busvine JR, editor. Insects and Hygiene: The Biology and Control of Insects Pests of Medical and Domestic Importance. 3rd ed. London, England: Chapman and Hall; 1980. Christopher SR. Aedes aegypti (L.), the Yellow Fever Mosquito. London, England: Cambridge University Press; 1960. Schaffner F, Medlock JM, Van Bortel W. Public health significance of invasive mosquitoes in Europe. Clin Microbiol Infect. 2013; 19(8):685–692. Marquardt W, editor. Biology of Disease Vectors. 2nd ed. Burlington, Canada: Academic Press; 2004. Becker N, Petric D, Zgomba M, et al. Mosquito and their Control. 2nd ed. Berlin, Germany: Springer; 2010. Clements AN. The Biology of Mosquitoes. Volume 1: Development, Nutrition and Reproduction. Wallingford, CT: CABI Publishing; 2000. Silver JB. Mosquito Ecology: Field Sampling Methods. Berlin, Germany: Springer; 2008. Hawley WA. The biology of Aedes albopictus. J Am Mosq Control Assoc Suppl. 1988;1:1–39. Clements AN. The Biology of Mosquitoes. Volume 2: Sensory Reception and Behavior. Wallingford, CT: CABI Publishing; 1999. Ciota AT, Drummond CL, Ruby MA, Drobnack J, Ebel GD, Kramer LD. Dispersal of Culex mosquitoes (Diptera: Culicidae) from a wastewater treatment facility. J Med Entomol. 2012;49(1):35–42. Hawley WA, Reiter P, Copeland RS, Pumpuni CB, Craig GB Jr. Aedes albopictus in North America: probable introduction in used tires from northern Asia. Science. 1987;236(4805):1114–1116. European Centre for Disease Prevention and Control. Guidelines for the Surveillance of Invasive Mosquitoes In Europe. Stockholm, Sweden: ECDC; 2012.
WHO. World Health Day 2014: vector-borne diseases. Available from: http://www.who.int/campaigns/world-health-day/2014/vector-borne-diseases/en/. Accessed November 13, 2015. GBD 2013 DALYs and HALE Collaborators, Murray CJ, Barber RM, et al. Global, regional, and national disability-adjusted life years (DALYs) for 306 diseases and injuries and healthy life expectancy (HALE) for 188 countries, 1990–2013: quantifying the epidemiological transition. Lancet. 2015;386(10009):2145–2191. World Health Organization. World Malaria Report 2014. Geneva, Switzerland: WHO; 2014. Millar SB, Cox-Singh J. Human infections with Plasmodium knowlesi-zoonotic malaria. Clin Microbiol Infect. 2015;21(7):640–648. World Health Organization. Lymphatic filariasis. Fact sheet No 102 [updated May 2015]. Available from: http://www.who.int/mediacentre/factsheets/fs102/en/. Accessed November 13, 2015. World Health Organization. Geographical Distribution of Arthropod-borne Diseases and their Principal Vectors [WHO/VBC/89.967]. Geneva, Switzerland: WHO; 1989. Eliasson H, Broman T, Forsman M, Bäck E. Tularemia: current epidemiology and disease management. Infect Dis Clin North Am. 2006;20(2):289–311. Farrar J, Hotez P, Junghanss T, Kang G, Lalloo D, White NJ, editors. Manson’s Tropical Diseases. 23rd ed. China: Saunders Ltd. 2014. World Health Organization. Yellow fever. Fact sheet No 100 [updated March 2014]. Available from: http://www.who.int/mediacentre/factsheets/fs100/en/. Accessed November 13, 2015. World Health Organization. Dengue and severe dengue. Fact sheet No 117 [updated May 2015]. Available from: http://www.who.int/mediacentre/factsheets/fs117/en/. Accessed November 13, 2015. World Health Organization. Japanese encephalitis. Fact sheet No 386 [updated March 2014]. Available from: http://www.who.int/mediacentre/factsheets/fs386/en/. Accessed November 13, 2015. Sambri V, Capobianchi M, Charrel R, et al. West Nile virus in Europe: emergence, epidemiology, diagnosis, treatment, and prevention. Clin Microbiol Infect. 2013;19(8):699–704. 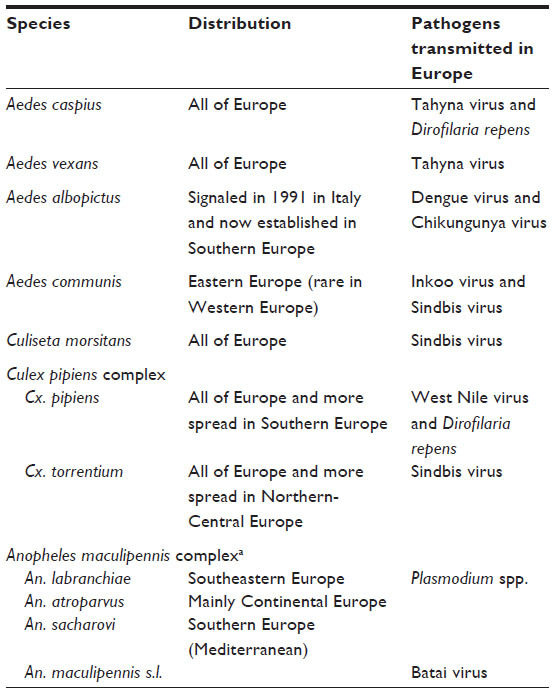 Hubálek Z. Mosquito-borne viruses in Europe. Parasitol Res. 2008; 103(Suppl 1):S29–S43. Cao-Lormeau VM, Roche C, Teissier A, et al. Zika virus, French polynesia, South Pacific, 2013. Emerg Infect Dis. 2014;20(6):1085–1086. World Health Organization. Chikungunya. Fact sheet No 327 [updated May 2015]. Available from: http://www.who.int/mediacentre/factsheets/fs327/en/. Accessed November 13, 2015. Vasconcelos PF, Travassos da Rosa AP, Rodrigues SG, Travassos da Rosa ES, Dégallier N, Travassos da Rosa JF. Inadequate management of natural ecosystem in the Brazilian Amazon region results in the emergence and reemergence of arboviruses. Cad Saude Publica. 2001; 17(Suppl):155–164. Tesh RB, Saidi S, Gajdamovic SJ, Rodhain F, Vesenjak-Hirjan J. Serological studies on the epidemiology of sandfly fever in the Old World. Bull World Health Organ. 1976;54(6):663–674. Le Lay-Roguès G, Valle M, Chastel C, Beaucournu JC. Small wild mammals and arboviruses in Italy. Bull Soc Pathol Exot Filiales. 1983; 76(4):333–345. Attoui H, Mohd Jaafar F, de Micco P, de Lamballerie X. Coltiviruses and seadornaviruses in North America, Europe, and Asia. Emerg Infect Dis. 2005;11(11):1673–1679. Franz AWE, Kantor AM, Passarelli AL, Clem RJ. Tissue barriers to arbovirus infection in mosquitoes. Viruses. 2015;7(7):3741–3767. Balenghien T, Vazeille M, Grandadam M, et al. Vector competence of some French Culex and Aedes mosquitoes for West Nile virus. Vector Borne Zoonotic Dis. 2008;8(5):589–595. Engler O, Savini G, Papa A, et al. European surveillance for West Nile virus in mosquito populations. Int J Environ Res Public Health. 2013; 10(10):4869–4895. FAO, WHO. Rift Valley Fever Outbreaks Forecasting Models. Rome, Italy: FAO; 2008. Weaver SC, Forrester NL. Chikungunya: evolutionary history and recent epidemic spread. Antiviral Res. 2015;120:32–39. Reiter P. Yellow fever and dengue: a threat to Europe? Euro Surveill. 2010;15(10):19509. Gratz NG. Critical review of the vector status of Aedes albopictus. Med Vet Entomol. 2004;18(3):215–227. Kutsuna S, Kato Y, Moi ML, et al. Autochthonous dengue fever, Tokyo, Japan, 2014. Emerg Infect Dis. 2015;21(3):517–520. Morillon M, Mafart B, Matton T. Yellow fever in Europe during 19th century. In: Bennike P, Bodzsar EB, Suzanne C, editors. Ecological Aspects of Past Settlement in Europe. Budapest, Hungary: European Anthropological Association, Eötvös University Press; 2002. Louis C. Daily newspaper view of dengue fever epidemic, Athens, Greece, 1927–1931. Emerg Infect Dis. 2012;18(1):78–82. Eisen L, Monaghan AJ, Lozano-Fuentes S, Steinhoff DF, Hayden MH, Bieringer PE. The impact of temperature on the bionomics of Aedes (Stegomyia) aegypti, with special reference to the cool geographic range margins. J Med Entomol. 2014;51(3):496–516. European Centre for Disease Prevention and Control. West Nile fever maps – historical data. Available from: http://ecdc.europa.eu/en/healthtopics/west_nile_fever/West-Nile-fever-maps/Pages/historical-data.aspx. Accessed November 13, 2015. Barzon L, Pacenti M, Franchin E, et al. The complex epidemiological scenario of West Nile virus in Italy. Int J Environ Res Public Health. 2013;10(10):4669–4689. Nikolay B. A review of West Nile and Usutu virus co-circulation in Europe: how much do transmission cycles overlap? Trans R Soc Trop Med Hyg. 2015;109(10):609–618. Calzolari M, Bonilauri P, Bellini R, et al. Evidence of simultaneous circulation of West Nile and Usutu viruses in mosquitoes sampled in Emilia-Romagna region (Italy) in 2009. PLoS One. 2010; 5(12):e14324. Calzolari M, Bonilauri P, Bellini R, et al. Usutu virus persistence and West Nile virus inactivity in the Emilia-Romagna region (Italy) in 2011. PLoS One. 2013;8(5):e63978. Suhrbier A, Jaffar-Bandjee MC, Gasque P. Arthritogenic alphaviruses – an overview. Nat Rev Rheumatol. 2012;8(7):420–429. Calzolari M, Bonilauri P, Bellini R, et al. Arboviral survey of mosquitoes in two northern Italian regions in 2007 and 2008. Vector Borne Zoonotic Dis. 2010;10(9):875–884. Sonnleitner ST, Lundström J, Baumgartner R, et al. Investigations on California serogroup orthobunyaviruses in the Tyrols: first description of Tahyna virus in the Alps. Vector Borne Zoonotic Dis. 2014; 14(4):272–277. Lundström JO, Andersson AC, Bäckman S, Schäfer ML, Forsman M, Thelaus J. Transstadial transmission of Francisella tularensis holarctica in mosquitoes, Sweden. Emerg Infect Dis. 2011;17(5):794–799. Hellenic Center for Disease Control and Prevention. Epidemiological surveillance report, malaria in Greece, 2014. Available from: http://www.keelpno.gr/Portals/0/%CE%91%CF%81%CF%87%CE%B5%CE%AF%CE%B1/%CE%95%CE%BB%CE%BF%CE%BD%CE%BF%CF%83%CE%AF%CE%B1/2015/Malaria%20annual%20report_2014_EN_final.pdf. Accessed November 13, 2015. Romi R, Sabatinelli G, Majori G. Could malaria reappear in Italy? Emerg Infect Dis. 2001;7(6):915–919. Petersen E, Severini C, Picot S. Plasmodium vivax malaria: a re-emerging threat for temperate climate zones? Travel Med Infect Dis. 2013;11(1):51–59. European Centre for Disease Prevention and Control. Annual Epidemiological Report 2014 – Emerging and Vector-borne Diseases. Stockholm, Sweden: ECDC; 2014. Rezza G, Nicoletti L, Angelini R, et al; CHIKV study group. Infection with chikungunya virus in Italy: an outbreak in a temperate region. Lancet. 2007;370(9602):1840–1846. Grandadam M, Caro V, Plumet S, et al. Chikungunya virus, southeastern France. Emerg Infect Dis. 2011;17(5):910–913. Institut de Veille Sanitaire. Chikungunya et dengue – Données de la surveillance renforcée en 2014. Available from: http://www.invs.sante.fr/Dossiers-thematiques/Maladies-infectieuses/Maladies-a-transmission-vectorielle/Chikungunya/Donnees-epidemiologiques. Accessed December 26, 2016. La Ruche G, Souarès Y, Armengaud A, et al. First two autochthonous dengue virus infections in metropolitan France, September 2010. Euro Surveill. 2010;15(39):19676. Gjenero-Margan I1, Aleraj B, Krajcar D, et al. Autochthonous dengue fever in Croatia, August–September 2010. Euro Surveill. 2011;16(9). pii: 19805. Schmidt-Chanasit J, Haditsch M, Schoneberg I, Gunther S, Stark K, Frank C. Dengue virus infection in a traveller returning from Croatia to Germany. Euro Surveill. 2010;15(40). pii: 19677. European Centre for Disease Prevention and Control. Chikungunya Case in Spain without Travel History to Endemic Areas. Stockholm, Sweden: ECDC; 2015. Zammarchi L, Stella G, Mantella A, et al. Zika virus infections imported to Italy: clinical, immunological and virological findings, and public health implications. J Clin Virol. 2015;63:32–35. Duong V, Lambrechts L, Paul RE, et al. Asymptomatic humans transmit dengue virus to mosquitoes. Proc Natl Acad Sci U S A. 2015; 112(47):14688–14693. Bellini R, Medici A, Calzolari M, et al. Impact of Chikungunya virus on Aedes albopictus females and possibility of vertical transmission using the actors of the 2007 outbreak in Italy. PLoS One. 2012; 7(2):e28360. EFSA Opinion. The Risk of a Rift Valley Fever Incursion and its Persistence within the Community [Question number: EFSA-Q-2004-050]; 2005. Bellini R, Calzolari M, Mattivi A, et al. The experience of West Nile virus integrated surveillance system in the Emilia-Romagna region: five years of implementation, Italy, 2009 to 2013. Euro Surveill. 2014; 19(44). pii: 20953. Zeller H, Marrama L, Sudre B, Van Bortel W, Warns-Petit E. Mosquito-borne disease surveillance by the European Centre for Disease Prevention and Control. Clin Microbiol Infect. 2013;19(8):693–698. European Centre for Disease Prevention and Control. West Nile virus risk assessment tool. Available from: http://ecdc.europa.eu/en/healthtopics/west_nile_fever/risk-assessment-tool/Pages/risk-assessment-tool.aspx. Accessed June 1, 2015. Beer M, Conraths FJ, van der Poel WH. ‘Schmallenberg virus’ – a novel orthobunyavirus emerging in Europe. Epidemiol Infect. 2013; 141(1):1–8. King AMQ, Adams MJ, Carstens EB, Lefkowitz EJ. Virus Taxonomy: Classification and Nomenclature of Viruses: Ninth Report of the International Committee on Taxonomy of Viruses. San Diego, CA: Elsevier Academic Press; 2012.